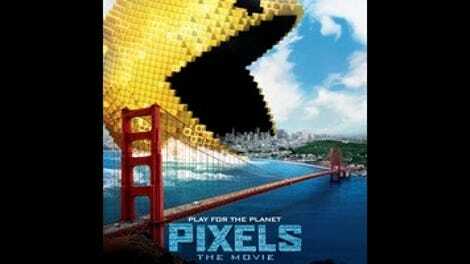 Pixels rests on a terrible implausibility. Not the idea that aliens might intercept broadcasts of early ’80s arcade games and misinterpret them as an act of war, sending large-scale versions of those games to attack Earth in retaliation. That requires minimal summer-movie buy-in (though even the anything-goes Futurama, in its concisely hilarious version of this story, told it as a non-canon what-if episode—and eight years before the short that serves as basis for this feature). 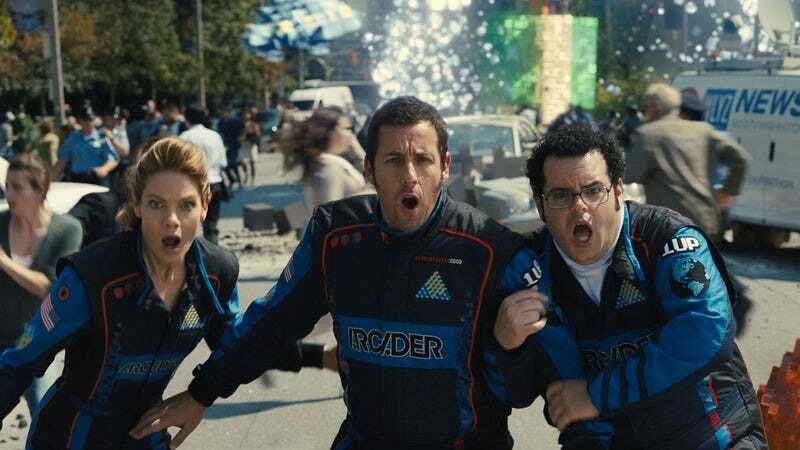 No, behind Pixels’ high-concept silliness lurks a conceit that further challenges rational thought: the idea that in this movie, Adam Sandler’s character self-identifies as a nerd. Through this point, Brenner’s personality hasn’t really registered as nerdy, despite his arcade prowess; he’s just another middle-aged Sandler Guy wearing shorts and delivering low-energy quips. But when he goes on an installation call and sort of connects with Violet (Michelle Monaghan), he tries to rouse those low-energy quips into quasi-romantic banter. Director Chris Columbus handles the scene with such typically leaden, pause-heavy reverence to the material (or in this case, the lack of material) that Sandler, not nimble enough as a romantic lead to pull off the love-hate bickering (weirdly and awkwardly photocopied from Blended), appears not just out of his comfort zone but fully unaware of it. Brenner’s flirtatious spat with Violet is capped with an assertion that, as a nerd, he’s a really good kisser; nerds, after all, are more grateful for romantic attention than confident, handsome rich guys on yachts. But that pandering line doesn’t seem to understand nerdiness so much as conflate it with the slobs-versus-snobs dynamic Sandler loves—and in case that’s unclear, Brenner then specifically calls Violet a snob. In true Sandler fashion, this becomes a feeble imitation of a running joke, which is to say he repeats unimaginative variations on the insult (they’re all basically, “Okay there, snobby”) ad infinitum. It’s banter reduced to a playground taunt, a routine Sandler continues when Cooper asks him to consult on the video game invasion (alongside Violet, who turns out to be a weapons specialist for the White House), including another molasses-paced scene where Brenner methodically and lamely insults everyone in the Situation Room. Joylessly obsessed with video games and impotently insulting anyone who disagrees with him? Maybe Brenner does fit a nerd profile after all: He’s a poster man-child for angry internet trolls. Even on its own silly terms, Pixels is not a very good movie; it’s painted up like a Ghostbusters-style fantasy-comedy but plays like so many slapdash Happy Madison productions before it. But it’s not the least funny Sandler movie of recent years, mostly because of its non-Sandler recruits. To game the Earth to safety, Brenner teams up with Ludlow (Josh Gad), an oddball conspiracy theorist, and Eddie Plant (Peter Dinklage), who beat Brenner at Donkey Kong years ago, must be sprung from prison, and is clearly modeled after Billy Mitchell, the villain of Seth Gordon’s documentary The King Of Kong. Both actors are doing zany shtick, but at least they’re doing it with energy, and their characters’ outlandishness seems to inspire screenwriters Tim Herlihy and Timothy Dowling to write some better jokes. (Ludlow, for example, believes that the Zapruder film was edited to hide the fact that “JFK shot first.”) In plenty of other movies, Gad’s sweaty-weirdo routine feels like second-rate Jack Black; in a Happy Madison production, he almost counts as inspired. Gad also does a decent job assaying a broad version of what Toby from American Splendor would call a “genuine nerd.” Sandler, for his part, just steps back and looks tired, in a checked-out performance that invites idle thoughts about whether his fondness for product placement has expanded to include Dan Aykroyd’s Crystal Head Vodka. (Signs point to yes: Both Aykroyd and a vodka-filled skull make brief, separate appearances.) Sandler barely interacts with any of his co-stars—including the special effects, which are brightly colored but rarely exciting, awe-inspiring, or even particularly funny. A giant Pac-Man comes the closest, but the film never seizes on animation as an opportunity for nerdy visual jokes in the style of Futurama or Wreck-It Ralph. Rather, it wants credit just for showing up, in the style of 2015 Adam Sandler.